We provide FUN, exciting and unforgettable corporate team building programs that energize and excite your workplace. Through our corporate team building exercises, we will help your organization work on leadership development, employee leadership skills and management training with fun-filled, exciting experiences your entire team will enjoy. Our three-day meetings disengage people after the first eight-hour session. Is there a way to break up the monotony and incorporate fun to get people back on track? We're bringing in people from all over the world for our annual meeting. They rarely see each other and usually communicate via phone, voicemail, or email. What can we do to get them to interact with each other and learn more about their colleagues? As a meeting planner, I am looking for an entertainment-type program delivered with professionalism that won't compromise my company's integrity. Where can I find a vendor that will provide a unique, professional program from planning to delivery? While these are some of the problems we've dealt with, we do customize to fit your specific needs, objectives and goals. Corporate team building exercises are a great way to establish a fun, positive environment for your next corporate event. It takes time and energy to research and interview companies to provide value to your meetings. 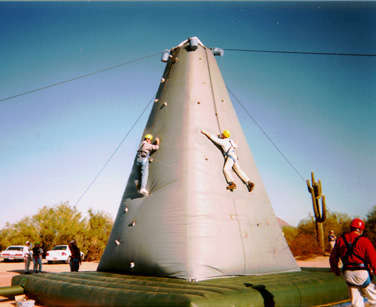 The best investment you can make is to use Executive Edge, Inc., for your corporate team building training. We provide cutting-edge corporate team building programs that are great when seeking entertainment for meetings all over the world. We work with you to make it easy to plan your meeting and guarantee success, as well as a polished delivery. But don't just take our word about our team building exercises, listen to our clients as well. They call the corporate team building "a fun, energetic super experience!"